If there’s one thing I am good at, it’s throwing a party. Over the years, I have thrown parties for all sorts of things. I just love any excuse to get people together, serve tasty dishes and stock the bar! We’ve celebrated everything from Chris’s 30th birthday, which was a surprise party – complete with flying Chris’s little brother in from New Mexico and arranging for him to have the day off from work with his boss, to my 33 birthday, which was an 80’s party to Chris getting a new job – that was a Hawaiian luau party in the backyard, complete with tiki torches, and a dip in the pool. When the holidays roll around, parties are even easier to orchestrate, as everyone wants to bring out their party shoes and Santa hats, right? Even grumpy old Scrooges want to get together and celebrate the season of togetherness when December rolls around! And the parties don’t have to stop after Christmas because there’s still New Year’s Eve to look forward to! So many people avoid throwing parties because they think it’s too much work. Really, it’s only as much work as you want it to be! There are a ton of ways to make parties low-key and low-stress, you just have to learn to focus on what’s really important for the success of a great party! Don’t worry about cleaning the house from top to bottom. A night time party means the lights will be low, and people are going to be mingling and drinking, not inspecting your bookshelf for dust particles. Give the house a good vacuum, mop the floors and clean the bathroom, where those bright florescent lights are totally unforgiving. Stock the bathroom! Don’t just put a new roll of toilet paper on the holder, add back up right next to the toilet so that there are no “Can someone bring me toilet paper? !” screams from the bathroom mid-party. Charmin sent me two packages of the new Ultra Strong and Ultra Soft for our family’s annual Progressive Christmas Dinner, which I kept right next to the toilet! I also like to make sure that there is air freshener and wet wipes in the bathroom during parties. It really helps people feel more comfortable knowing that they don’t have to be embarrassed when they walk out of the bathroom! Buy pre-made party food to save time in the kitchen. I always hit up Costco, Sam’s Club or the frozen foods section of Walmart for the bigger, party-sized appetizers. Just pop them in the oven an hour or so before your party and save yourself tons of prep time in the kitchen! I also invested in electric buffet servers a few years ago so that my party food stays hot throughout the entire party. You can find them on sale at Macy’s for around $20-$30 during the holidays and they make life so much easier! Make your party BYOB. Whenever Chris and I host a party, we always tell our guests that we will provide a few staples (vodka and rum) as well as the mixers, but for our guests to bring their favorite liquors. If you’ve ever thrown a party then you know how much a well-stocked bar can cost! You’ll save so much money if you ask guests to bring their own booze, and there’s the added bonus that most people will leave what’s leftover so that they don’t have an open container in their vehicle on the way home. Then you have extra for the next party! Just have fun! I promise you, the main thing your guests are looking forward to when coming to a party is to spend time with you! Don’t sweat the small stuff. Just relax and have fun! 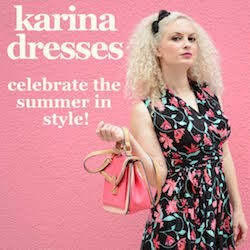 « Win a New Wardrobe with the Karina Dresses #Dresstacular #Giveaway Event! Great tips! You definitely don’t want to run out of toilet paper! Ha ha! I’ve been to a party where there was no toilet paper in the bathroom. AWKWARD… Since then, I’ve always made sure that there was PLENTY in our bathroom! This is an ongoing joke that we have —- seriously —– stay stocked up on toilet paper!! We had an icestorm where we couldn’t leave the house for 5 days and were rationing toilet paper! We’ll never let our supply dwindle again, especially during winter. Great tips! Pretty sure we will be throwing a movie party for two, though. lol But, toilet paper is one of those things that’s easy to forget for parties! Ha, the memories 🙂 When Hubby & I were dating we were at a party at his friend’s house who is an attorney (I was meeting them for the first time) and I got stuck without tp. It was such an awkward moment! I don’t even know who came to my rescue but I vowed to never let it happen at my house. We are having our first New Year’s Eve party this year. Thanks for the tips. I don’t throw too many parties, but thanks for the tips.